Lowest rates on the island! Bonaire Boat Rental is active on Bonaire for already more than 10 years and operates the most Modern Fleet of Rental Boats on the Island. We offer a variety of boats, from super cool Wake board Boats to easy going Lounge Boats. We also offer several water activities, - sports and - lessons. Renting a boat with Bonaire Boat Rental will guarantee a day of fun on the water. Bonaire Boat Rental: Better Boats, Better Service, Better Prices! Step aboard on one of our comfortable boats! Our boats are equipped with all the necessities for an unforgettable day at sea. Sail around the coast or visit Klein Bonaire. Its cool, fun and very easy to learn. 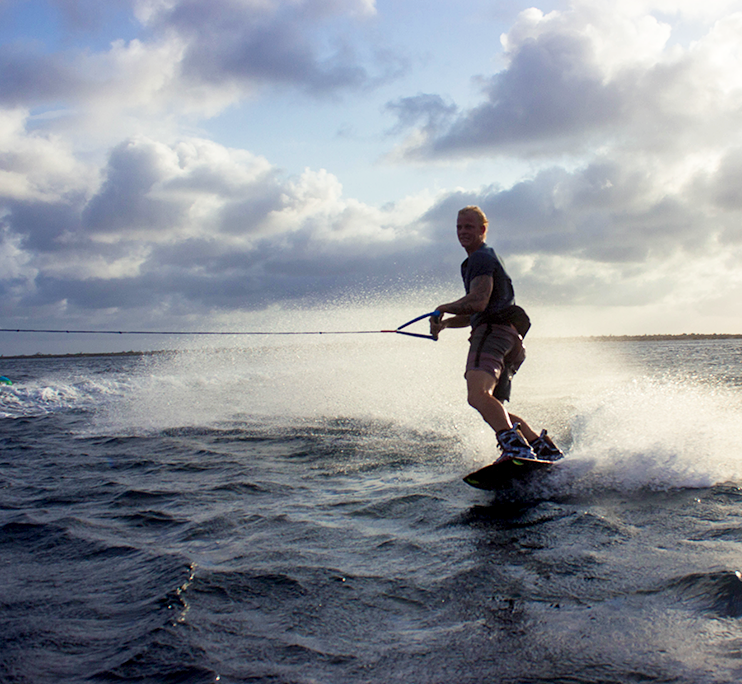 At Bonaire Boat Rental we have the right boards for beginners, but also for really experienced boarders. Never been on a Wake Board?, no problem! Our experienced instructors will be happy to help you with tips and instructions and you'll find yourself 'Riding Waves' within an hour. It's true, at Bonaire Boat Rental we rather watch fish then catch them. But we have our Hurricane sundeck boats who are very comfortable for a nice fishingday. Bonaire is amongst the most beautiful places in the world to watch the sunset. And know it's possible at Bonaire Boat Rental to take your partner for a sunset tour on your own privet Hurricane Boat. It's amazing! Skies glow up in bright orange, red and purple and with a little luck you'll see the famous Green Flash phenomenon. What is more beautiful than enjoying this moment of the day on the water? Book our boats during sunset for an experience that will linger for the rest of your life. Do you wish to explore the waters of Bonaire without the hassle of driving a boat? Why not book the Bonaire Boat Rental Boat Tour with Captain? We offer you hours of relaxation on the waters with beaches, swimming, snorkeling, wake boarding or tube riding of course we'll be happy to show and tell you about the coast line of Bonaire. We also do private diving and snorkeling tours. Our captain and dive master will bring you to the nicest diving and snorkeling spots from Bonaire. The max of guest will be 6 persons and the tour wil be 3 hours. Search for the Green Flash! Have a question about our boats? Ready to make a reservation? Give us a call at +599 701 9999 and we will be happy to help. You can also book 24/7 online. For other inquiries, please email us at bonaireboatrental@gmail.com. We are located at Harbour Village Marina.